RapidMiner Named a Leader in the Gartner’s 2019 Magic Quadrant for Data Science and Machine Learning Platforms for Sixth Consecutive Year. According to Gartner, Leaders should drive market transformation. They have the highest combined scores for Ability to Execute and Completeness of Vision. They are doing well and are prepared for the future with a clear vision and a thorough appreciation of the broader context of digital business. They have strong channel partners, a presence in multiple regions, consistent financial performance, broad platform support and good customer support. Here is the complimentary Gartner report. 1. 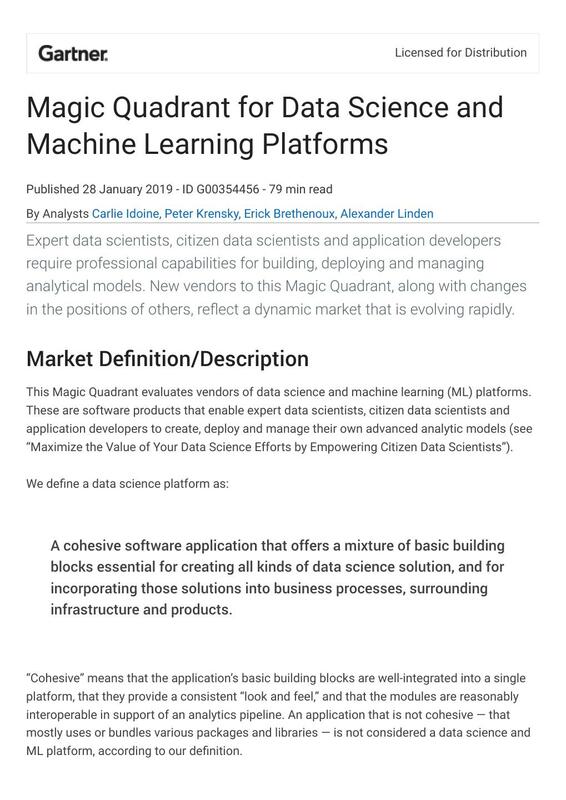 Licensed for Distribution Magic Quadrant for Data Science and Machine Learning Platforms Published 28 January 2019 - ID G00354456 - 79 min read By Analysts Carlie Idoine, Peter Krensky, Erick Brethenoux, Alexander Linden Expert data scientists, citizen data scientists and application developers require professional capabilities for building, deploying and managing analytical models. New vendors to this Magic Quadrant, along with changes in the positions of others, reﬂect a dynamic market that is evolving rapidly. Market Deﬁnition/Description This Magic Quadrant evaluates vendors of data science and machine learning (ML) platforms. These are software products that enable expert data scientists, citizen data scientists and application developers to create, deploy and manage their own advanced analytic models (see “Maximize the Value of Your Data Science Efforts by Empowering Citizen Data Scientists”). We deﬁne a data science platform as: A cohesive software application that offers a mixture of basic building blocks essential for creating all kinds of data science solution, and for incorporating those solutions into business processes, surrounding infrastructure and products. “Cohesive” means that the application’s basic building blocks are well-integrated into a single platform, that they provide a consistent “look and feel,” and that the modules are reasonably interoperable in support of an analytics pipeline. An application that is not cohesive — that mostly uses or bundles various packages and libraries — is not considered a data science and ML platform, according to our deﬁnition. 2.A data science and ML platform supports various skilled data scientists in multiple tasks across the data and analytics pipeline. These range from data ingestion, data preparation, interactive exploration and visualization and feature engineering to advanced modeling, testing and deployment. Within the ﬁeld of data science, ML is the most popular area. It is one that warrants speciﬁc attention by those evaluating these platforms. Not all organizations build all of their data science and ML models from scratch. Some may need assistance with getting started with or extending their data science and ML initiatives. Although this Magic Quadrant does assess the availability of prepackaged content, such as templates and samples, it does not assess service providers who can help jump-start or extend data science and ML application throughout an organization (as outlined in “Market Guide for Data Science and Machine Learning Service Providers”). Nor does this Magic Quadrant assess specialized vendors of industry-, domain- or function-speciﬁc solutions. Readers of this Magic Quadrant should understand that: ■ This market features a diverse range of vendors: Gartner invited a wide range of data science and ML platform vendors to participate in the evaluation process for potential inclusion in this Magic Quadrant. Users of these platforms, who include data scientists, citizen data scientists and application developers, have different requirements and preferences for user interfaces (UIs) and tools. Expert data scientists prefer to code data science models in Python or R, or to build and run data models in notebooks. Other users are most comfortable building models by using a point-and-click UI to create visual pipelines. Many members of emerging citizen data science communities favor a much more augmented approach that uses ML techniques “behind the scenes” to guide these less expert data scientists through the model building and operationalization process (see “Build a Comprehensive Ecosystem for Citizen Data Science to Drive Impactful Analytics”). Over time, expert data scientists may also come to prefer an augmented approach, which would enable them to navigate the model-building and operationalization process more efﬁciently. Tool and use case diversity is more important than ever. ■ A Leader may not be the best choice: The wide range of products available offers a breadth and depth of capability, and varied approaches to developing, operationalizing and managing models. It is therefore important to evaluate your speciﬁc needs when assessing vendors. A vendor in the Leaders quadrant, for example, might not be the best choice for you. Equally, a Niche Player might be the perfect choice. For an extensive review of the functional capabilities of each platform, see “Critical Capabilities for Data Science and Machine Learning Platforms.” Bear in mind that this Magic Quadrant includes only a small selection of the hundreds of vendors in this market. 3.■ Only vendors with commercially licensable products are included: Pure open-source platforms are excluded from this Magic Quadrant. Only commercially licensed open-source platforms are included. We do, however, recognize the growing trend for commercial platforms to use open-source libraries and content. Vendors take different approaches to including and supporting open source. Open-source solutions represent an opportunity for both users and vendors to get started with data science and ML with little upfront investment (see Note 1). In addition, many users of data science and ML platforms are either already proﬁcient in or can easily learn and apply open-source technologies. Leveraging open source through collaborative or orchestrated integration with commercial offerings also eliminates the need for a vendor to re-create speciﬁc capabilities within its own platform, as innovation is fast-paced within the open-source community. This approach enables a vendor to keep up with fast-changing algorithms and approaches, while focusing on capabilities that differentiate it from their competitors. However, a platform’s ease of use may suffer if its vendor does not account for the needs of all types of user. ■ Platforms must support not only model building but also model operationalization: The full beneﬁt — including business value — of data science and ML will not be achieved unless models are both: 1. ■ Embedded in business processes 2. ■ Maintained, monitored and managed over time The Gartner Data Science Team Survey of January 2018 found that over 60% of models developed with the intention of operationalizing them were never actually operationalized (see “How to Operationalize Machine Learning and Data Science Projects”). There are many reasons for this, but a crucial one is a lack of tools to enable and facilitate operationalization, which is not just about deployment. Operationalization extends to ongoing review and adjustment of models to ensure their relevancy over time as the business and its objectives change. It also requires ongoing management of models across the organization. ■ Artiﬁcial intelligence (AI) is hyped: Hype about AI is at its peak, but AI must be distinguished from data science and ML. Of course, data science is a core discipline for the development of AI, and ML is a core enabler of AI, but this is not the whole story. ML is about creating and training models; AI is about using those models to infer conclusions under certain conditions. AI is on a different level of aggregation to data science and ML. AI is at the application level. Data science and ML models must be combined to work together with other capabilities, such as a UI and workﬂow management, to constitute an AI application. A self-driving car, for example, has ML capability, but its AI requires much more than that. 8. data science talent. ■ Open-source shortcomings: Like many open-source promoters, Anaconda suffers from the usual drawbacks associated with large and ﬂexible developer communities: backward compatibility issues between versions; lack of visibility into important upcoming capabilities (model operationalization, for example); lack of code optimization for models’ integration with existing applications; and, despite marked progress in terms of workbench homogeneity, a lack of overall coherence. ■ Automation and augmentation: Novice Anaconda users will have difﬁculty ﬁnding their way through the Python “jungle.” Citizen data scientists will ﬁnd themselves in uncharted territory within Anaconda’s environment. Also, the do-it-yourself skills and attitude exhibited by typical Anaconda users are not suited to ML automation practices (such as AutoML’s automation of only part of the model development process), which are increasingly popular with data scientists. Databricks Databricks (https://databricks.com/) is based in San Francisco, U.S. Its Apache Spark-based Uniﬁed Analytics Platform combines data engineering and data science capabilities that use a variety of open-source languages. In addition to Spark, the platform provides proprietary features for security, reliability, operationalization, performance and real-time enablement on Amazon Web Services (AWS). Azure Databricks, which became generally available in March 2018, is an integrated service within Microsoft Azure that provides a high-performance Apache Spark-based platform optimized for Azure. Databricks remains a Visionary by providing support for the end-to-end analytic life cycle, hybrid cloud environments and accessibility for a wide variety of users. A focus on innovation and a consistently strong and comprehensive product offering have enabled Databricks to improve its position for both Ability to Execute and Completeness of Vision. Strengths ■ Innovation: Breadth and ease of open-source integration, streaming IoT capabilities and operationalization capabilities are key differentiators for Databricks. Its platform extends on open-source capabilities by providing the framework needed for end-to-end enterprise scalability, performance and operationalization. Databricks Delta, launched in October 2017, provides a managed cloud service for uniﬁed data management with support for streaming analytics and ML. MLﬂow, launched in June 2018, includes support for experimentation, reproducibility and deployment. The Databricks Runtime for Machine Learning provides preconﬁgured clusters for deep learning. 10. of Dataiku’s DSS platform. From data engineers to data scientists, subject matter experts and citizen data scientists, all of the principal roles involved in developing ML models have their place on the platform. It offers various user interface endpoints, all pointing to the same execution core, which makes it one of the most coherent offerings in this Magic Quadrant. ■ Ease of use: The qualities of Dataiku most often highlighted by clients are that its platform is relatively easy to learn and that it provides a rapid path to productivity. Automated ML capabilities and the explicit possibility of quickly delivering interpretable models also contribute to the platform’s intuitive feel and short learning curve. This approachable quality does not prevent experts and experienced data scientists from using notebook-style development capabilities that can complement overall team productivity. ■ Operationalization capabilities: Operationalization is the area in which DSS has made the most progress in the past year. Dataiku now includes model management and monitoring as ﬂexible deployment options. Its logical data science process pipeline view, and coherence around the various roles throughout that process, form a strong foundation for more comprehensive operationalization capabilities. Cautions ■ Scalability of models in production: Despite Dataiku’s newly improved model operationalization capabilities, some clients are still looking for a more seamless, less manual experience with better visualization functions for getting models into production. Reference customers reported that even the new model deployment capabilities do not always deliver as advertised. ■ Price and licensing: Dataiku’s customers often report a suboptimum sales experience, with some considering the company pricey, some regretting a lack of pricing visibility, and some frustrated by cumbersome pricing structures. Confusion about Dataiku’s pricing and licensing has been known to delay the sales cycle. ■ Streaming and the IoT: Being focused on ease of use and collaboration across roles, Dataiku’s DSS seems favored by service-centric organizations. This could also be explained by the fact that Dataiku does not offer strong IoT capabilities and functions, even if it has shown that its platform can operate in demanding and computationally intensive environments. DataRobot DataRobot (https://www.datarobot.com/) is based in Boston, Massachusetts, U.S. It provides an augmented data science and ML platform. The platform automates key tasks, enabling data scientists to work efﬁciently and citizen data scientists to build models easily. 12. demand end-to-end augmented capabilities. DataRobot’s concierge service featuring customer-facing data scientists is also difﬁcult to scale. Datawatch (Angoss) Datawatch (https://www.datawatch.com/) is based in Bedford, Massachusetts, U.S. In January 2018, it acquired Angoss and its main data science product components. These include KnowledgeSEEKER, the most basic offering, aimed at citizen data scientists in a desktop context; KnowledgeSTUDIO, which includes many more models and capabilities than KnowledgeSEEKER; and KnowledgeENTERPRISE, a ﬂagship product that includes the full range of capabilities. Angoss has over two decades’ experience, and has loyal customers in services-centric and ﬁnancial services organizations in particular. Often praised for its ease of use and intuitive interface, Angoss should beneﬁt from Datawatch’s extensive experience in data management and preparation. However, the inherent risk and integration uncertainties associated with every acquisition have impacted the company’s scores for Completeness of Vision and Ability to Execute. In theory, Angoss and Datawatch could emerge as a strong combination in this market, but the integration seems to still be a work in progress, which contributes to Datawatch’s position as a Niche Player. Strengths ■ Ease of use and product coherence: Customers continue to commend Angoss’ intuitive interface and well-rounded product functionality. The platform is well-suited to citizen data scientists looking for technological depth, reliability and a quick path to productivity. But the corollary of that strength is an above-average perceived TCO. ■ Customer support: Faithful to its long history, Angoss still strives to build strong customer relationships, as does its new parent. The company’s responsiveness and genuine interest in its clients’ business outcomes is the basis for its customers’ loyalty — something that “acquisition jitters” could compromise, if not handled properly. ■ Additional analytical functionality: Angoss has one of the few platforms that offer strong additional and well-integrated capabilities, such as an optimization engine (with KnowledgeOPTIMIZER) and text analytics capabilities (through KnowledgeREADER). Cautions ■ Acquisition uncertainties: Every acquisition — even those that are thoughtful and logical (from a technology perspective) — entails signiﬁcant risks. One of the most important, in this case, could be the risk of losing critical data science talent that is difﬁcult to replace. 13. Another is that the acquisition might delay important roadmap elements that are anxiously expected by clients, such as model operationalization capabilities. Potential customers should seek reassurance about Angoss’ roadmap execution before investing in its platform. ■ Vision and innovation: Despite progress from a development perspective, Angoss is losing ground in relation to advances such as deep learning and augmented ML functionality. The company also needs to improve its support for, and integration of, open-source capabilities. ■ Data preparation: Another area where clients have been asking for better support and functionality is data preparation and management. Given Datawatch’s strong expertise, the Angoss data science platform should see signiﬁcant improvement in 2019. Domino Domino (Domino Data Lab) (https://www.dominodatalab.com/) is headquartered in San Francisco, California, U.S. The Domino Data Science Platform represents a comprehensive end- to-end solution designed for expert data scientists. The platform incorporates both open- source and proprietary tool ecosystems, while providing capabilities for collaboration, reproducibility, and centralization of model development and deployment. Domino, which was founded in 2013, has moved from the Visionaries quadrant to the Niche Players quadrant. Its market presence continues to grow, but with a focus on the expert data science community. Low customer feedback scores and reliance on many components for comprehensive capabilities contribute to its new position in the Magic Quadrant. Strengths ■ Good product strategy: Reference customers scored Domino in the top quartile for product strategy. Product bundling and conﬁguration is straightforward. The roadmap focuses on collaboration and accessibility, building a tool- and platform-agnostic ecosystem, and driving the end-to-end analytic process through to operationalization, with the goal of making data science a scalable enterprise capability. ■ Open-source and proprietary tool integration: Domino emphasizes the ability to use open- source and proprietary software within a consistent container. Breadth and ease of open- source integration are strengths. Strong open-source support enables data scientists to use their tools of choice within the platform. Again this year, Domino received the highest overall score for ﬂexibility, extensibility and openness. ■ Collaboration and scalability: Domino’s reference customers especially praised the ease of collaboration in a shared environment for project teams using various tools, in conjunction with the ability to scale up computing resources as needed. 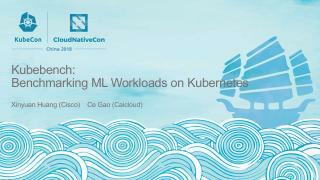 15. which ML can be implemented at scale, which is rivaled by few other companies at this point. Google’s TensorFlow and Kubernetes are the most popular choices for many AI startups and for cutting-edge university AI and data science teams. ■ Geared toward developers: With Cloud AutoML and most of its other tools, Google offers a high-quality software solution for non-data scientists, especially software developers. GCP users familiar with GCP tools will have increasingly less reason to look elsewhere for ML capabilities. Matters will improve even further with the addition of upcoming AutoML capabilities and on-premises functionality (such as those in the Kubernetes-based Kubeﬂow). Cautions ■ Lack of an end-to-end, coherent and easy-to-use ML offering: The third strength noted above also represents the biggest drawback for two large groups of data science constituents: core data scientists who lack familiarity with GCP and (even more so) business-oriented citizen data scientists. For those users, the learning curve for some Google tools can be steep. It is very fragmented and easily becomes overwhelming, especially for the many casual data scientists who spend only 15% to 20% of their time on core ML projects. ■ Currently limited on-premises capabilities: Users who require full on-premises capabilities can only use the open-sourced TensorFlow and Google’s Kubernetes-based Kubeﬂow. Yet most other development tools and prebuilt ML components reside fully in the cloud and are therefore less suitable for the many organizations that prefer to conduct ML capabilities on- premises. ■ Low-level instrumentalization, reuse and project transparency: Even GCP developers will ﬁnd little support for the creation and reuse of long ML pipelines. The tool chain and concepts simply do not yet allow for the notion of end-to-end ML projects. Google also makes heavy use of the open-source arsenal of ML components, yet offers little or no coherent project management support. Google’s new Kubeﬂow Pipelines may address some of these deﬁciencies, but it could not be evaluated as its announcement came after the cutoff date for this Magic Quadrant. H2O.ai H2O.ai (http://h2o.ai/) is based in Mountain View, California, U.S. and offers the free open- source H2O Open-Source Machine Learning (H2O, Sparkling Water and H2O4GPU) and a commercial product called H2O Driverless AI. H2O’s core strength is its high-performing ML components, which are tightly integrated within several competing platforms evaluated in this Magic Quadrant. 18. complexity and cause confusion. They could also increase licensing costs. ■ Capability shortcomings across both platforms: SPSS received low scores for ﬂexibility, extensibility and openness, automation and augmentation, and collaboration. Although, overall, Watson Studio provides stronger capabilities than SPSS, capabilities for data preparation, data exploration and visualization, delivery and precanned solutions are lacking. KNIME KNIME (https://www.knime.com/) is based in Zurich, Switzerland. It provides the KNIME Analytics Platform on a fully open-source basis for free, while a commercial extension, KNIME Server, offers more advanced functions, such as team, automation and deployment capabilities. KNIME remains a Leader in this Magic Quadrant. This is largely due to strong assessments by its customers, its competitive product offerings and its vision, which is one of the most balanced in this market. Strengths ■ Well-balanced execution and vision: With a wealth of well-rounded functionality, KNIME maintains its reputation for being the market’s “Swiss Army knife.” Its for-free and open- source KNIME Analytics Platform covers 85% of critical capabilities, and KNIME’s vision and roadmap are as good as, or better than, those of most of its competitors. ■ Sophistication with clear product bundling and low TCO: Even with advanced features like ML automation, hybrid cloud, new model management (KNIME Model Process Factory) and deployment, KNIME’s product segmentation has been clear and simple for many years. This simplicity does not prevent data scientists from exploiting advanced analytics features (such as deep learning) — it simply makes that power accessible to citizen data scientists, too. ■ Ease of use by those with intermediate skills: KNIME’s platform addresses the intermediate user skills spectrum very well, and KNIME recently began to place increased emphasis on two of the other skills segments. Less skilled users will appreciate the automated ML offerings included in KNIME Server. Developers will appreciate KNIME’s forthcoming Python integration, which will offer them two-way integration via the ability to call the KNIME API from within Python/Jupyter in order to use many of the thousands of KNIME modules and solutions. ■ Low barrier to entry and TCO: As in prior years, reference customers identiﬁed their main reasons for selecting the KNIME platform as its low TCO, predictable costs and value for money. 20. experts’ experiences through a “citizen engineer” approach aimed at democratizing deployment of its platform. Support for this community is also secured through a rich community ecosystem. ■ Data preparation: In its analytics workﬂow, MATLAB does not explicitly separate ML and deep learning techniques, as algorithms are considered ﬁt for solving speciﬁc problems. MathWorks’ platform therefore offers sophisticated data preparation and labeling capabilities for data that will be used to create deep learning models. ■ Advanced functionality: MathWorks has integrated into MATLAB a range of advanced techniques that can be used in complex use cases. Examples are interpreted notebook experiences (through MATLAB Live Editor), pretrained deep-learning models, embedded real- time analytics, streaming capabilities and simulation techniques (through digital-twin models). Cautions ■ Lack of focus on service-centric organizations: Although nothing prevents nonengineers from using MATLAB, MathWorks’ vision for data science does not focus on marketing, sales or customer service. Data science teams whose primary focus is marketing, sales or customer service should seek alternative platforms. ■ Full cloud platform support: MATLAB offers strong support for AWS and Microsoft Azure, but still lacks comprehensive support for GCP. Although environments such as the pervasive TensorFlow are supported within MATLAB, data science teams that rely on the tight integration between TensorFlow and GCP might not beneﬁt from the performance usually attested in Google-only frameworks. ■ AutoML capabilities: MathWorks has considerably improved its access to open-source libraries and environments in the latest version of MATLAB. However, compared with some of its more visionary competitors, MathWorks still lacks a clear integration vision in relation to AutoML capabilities. Microsoft Microsoft (http://www.microsoft.com/) is based in Redmond, Washington, U.S. It provides a number of software products for data science and ML. In the cloud, it offers Azure Machine Learning (including Azure Machine Learning Studio), Azure Data Factory, Azure HDInsight, Azure Databricks and Power BI. For on-premises workloads, Microsoft offers Machine Learning Server. Only Azure Machine Learning met the inclusion criteria for this Magic Quadrant, although Microsoft’s broader offerings did inﬂuence our assessments of Azure Machine Learning’s extended capabilities and Microsoft’s Completeness of Vision. 24. accords with the impending reality that the vast majority of business users will consume ML via applications with embedded intelligence. The SAP PA roadmap is closely tied to the company’s overall strategy for SAP Leonardo Machine Learning Foundation and establishing a new end-to-end life cycle for data science. This strategy will resonate with customers already heavily invested in SAP systems and applications, and with prospective customers seeking a way to bring AI to the masses. ■ Support for diverse data science professionals: SAP PA offers environments tailored for expert data scientists (Expert Analytics) and citizen data scientists (Automated Modeler). Business analysts among SAP’s reference customers identiﬁed automation for quick and easy prototyping as a major strength of the platform. SAP PA’s interfaces for C++ and Java will complement developers who might leverage pretrained models and AI services in the Leonardo ecosystem. Cautions ■ Product suite transition: In recent years, SAP has received consistently low scores from reference customers for most critical capabilities, and its data science offering will undergo signiﬁcant changes in the near future as SAP executes its broader AI strategy. SAP needs to catch up to its competitors in key innovation areas, such as agile support for increasingly demanded open-source technologies, deep learning, streaming and the IoT. ■ Customer experience and mind share: SAP still needs to improve aspects of its customer experience. Reference customers gave low scores for SAP’s inclusion of requested product enhancements, documentation, contract negotiation and account management. SAP continues to struggle to gain mind share for PA as dedicated data science vendors continue to disrupt this market and other large vendors develop new products. SAP appears on a low percentage of the shortlists, seen by Gartner, of those choosing a data science and ML platform, relative to other vendors in this Magic Quadrant. ■ Coherence: Although SAP PA beneﬁts from HANA’s functionality and other components, its reference customers gave it a low overall score for coherence. A fragmented toolchain is frustrating for users and results in convoluted workﬂows. Improving the coherence of the data science platform and creating a uniﬁed user experience will be crucial as SAP PA evolves within the larger SAP AI ecosystem. SAS SAS (http://www.sas.com/) is based in Cary, North Carolina, U.S. It provides many software products for analytics and data science. For this Magic Quadrant, we evaluated SAS Enterprise Miner (EM) and SAS Visual Data Mining and Machine Learning (VDMML). 26. increasingly used, along with SAS products, as a way of controlling costs, especially for new projects. ■ Coherence: SAS’s full complement of products is complex and often confusing. Offering two platforms that are not fully interoperable and that have numerous additional components available increases confusion and complexity in terms of managing, deploying and using SAS’s products. The coexistence of SAS Viya and SAS 9 perpetuates the perception of a lack of cohesion. Although SAS has made progress in this regard, migration is still perceived as an issue for those that want to exploit Viya’s capabilities but are not currently on that architecture. ■ Unfashionable interface of SAS EM: SAS EM has not kept up with the times and, though still effective, has a dated UI. Its UI contrasts with those of modern competitors, which are more intuitive and cleaner. SAS VDMML offers a much more modern UI, representing SAS’s future direction. ■ Flexibility and additional support for open source: In its latest release, SAS has added more tools and support for open source, but customers would like to see both SAS EM and VDMML continue to extend ﬁrst-class support for open-source tools, libraries and frameworks. SAS also needs to continue to improve support for Docker and containerization. TIBCO Software TIBCO Software (https://www.tibco.com/) is based in Palo Alto, California, U.S. Through the acquisition of enterprise reporting and modern BI platform vendors (Jaspersoft and Spotﬁre), descriptive and predictive analytics platform vendors (Statistica and Alpine Data), and a streaming analytics vendor (StreamBase Systems), TIBCO has built a well-rounded and powerful analytics platform. TIBCO has moved from the Challengers quadrant to the Leaders quadrant, thanks to a well- orchestrated integration strategy that contributes to its Ability to Execute, and its efforts to keep pace with the rate of innovation in this rapidly changing market. TIBCO has distinctive skill at serving asset-centric industries. In addition to having end-to-end development and deployment capabilities, TIBCO successfully addresses the underserved data science IoT analytics domain, partly as a result of its process-centric roots. Strengths ■ Successful consolidation: On a single platform, TIBCO brings together powerful visualization capabilities, strong descriptive analytics and visionary predictive analytics features (from Statistica and Alpine Data, now rebranded as Spotﬁre Data Science). 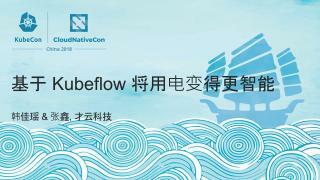 At the same time, TIBCO has maintained its platform’s necessary extensibility to open-source environments. 27. Open-source code, for example, can be developed within the platform or in an outside environment and then seamlessly integrated into the data science pipeline’s workﬂow. ■ “Connected Intelligence” and IoT: In addition to a strong set of connectors and APIs for machine data, real-time data capture and model scoring, TIBCO has invested in IoT edge analytics to give developers tools for distributing and monitoring models on edge devices and gateways. In addition, the combination of TIBCO Streaming and Statistica is a robust differentiator for TIBCO’s Connected Intelligence strategy. ■ End-to-end data science process: The overall ease of use of TIBCO’s platform (often praised by reference customers) should not overshadow the sophistication and completeness of its functionality. Visual workﬂows spanning the full data science process, from data ingestion to model management, provide a strong basis for effective collaboration by all roles (data scientists, business analysts, citizen data scientists, process engineers and so on). 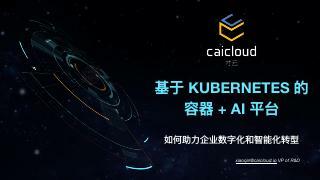 Cautions ■ Performance and stability: Some reference customers identiﬁed cases where the performance of TIBCO’s platform was suboptimal, and remarked that this temporarily slowed their development process. Upcoming improved integration with external cloud services, along with development of hybrid analytical workﬂows, could alleviate this problem. ■ Data management: TIBCO offers strong data access and visualization capabilities, but automated and more integrated data preparation and management capabilities should be an integral part of the platform, given its wide reach. We expect TIBCO to invest in this important functionality for its upcoming release. ■ Incomplete operationalization focus: TIBCO’s model management and deployment capabilities have improved greatly over the past year, but many gaps remain. Given TIBCO’s strength across a wide range of industries, model operationalization capabilities beyond deployment — that is, for the full governance and data science process for models in production — will be crucial. Vendors Added and Dropped We review and adjust our inclusion and exclusion criteria for Magic Quadrants as markets change. As a result of these adjustments, the mix of vendors in any Magic Quadrant may change over time. A vendor’s appearance in a Magic Quadrant one year and not the next does not necessarily indicate that we have changed our opinion of that vendor. It may be a reﬂection of a change in the market and, therefore, changed evaluation criteria, or of a change of focus by that vendor. 29. majority of their time. In this scenario, the organization, having implemented several data science solutions and delivered them to the business, has shifted its focus to improving and updating the existing models. ■ Nontraditional data science: This new use case represents a movement toward incorporating capabilities into the data science and ML platform that speciﬁcally support citizen data scientists and/or developers. Gartner deﬁnes a citizen data scientist as a person who creates or generates models that use advanced diagnostic analytics or predictive and prescriptive capabilities, but whose primary job function is outside the ﬁeld of statistics and analytics. We used the following 15 critical capabilities to score the vendors’ capabilities across the four use-case scenarios: ■ Data access: How well does the product support data access across many types of data (such as tables, images, graphs, logs, time series, audio and texts)? ■ Data preparation: Does the product have a signiﬁcant array of noncoding or coding data preparation features? ■ Data exploration and visualization: Does the product allow for a range of exploratory steps, including interactive visualization? ■ Automation and augmentation: Does the product facilitate the automation of feature generation and hyperparameter tuning? ■ User interface (UI): Does the product have a coherent “look and feel” and have an intuitive interface, ideally one supporting a visual pipelining component or visual composition framework (VCF)? ■ Machine learning (ML): How broad are the ML approaches that are easily accessible and shipped (prepackaged) with the product, along with support for modern ML approaches like ensemble techniques (boosting, bagging and random forests) and modern dimension reduction schemes? ■ Other advanced analytics: How are other methods from the ﬁelds of statistics, optimization, simulation, and text and image analytics, integrated into the development environment? ■ Flexibility, extensibility and openness: How can various open-source libraries be integrated into the platform? How can users create their own functions? How does the platform work with notebooks? ■ Performance and scalability: How can desktop, server and cloud deployments be controlled?